Formerly known as Philips Lighting, Signify is the world leader in connected LED lighting products, systems and services. Their innovations unlock the extraordinary potential of light to improve people’s quality of life. Signify works towards a sustainable future. Philips Lighting went public in 2016. Most members of the new annual reporting team were inexperienced. 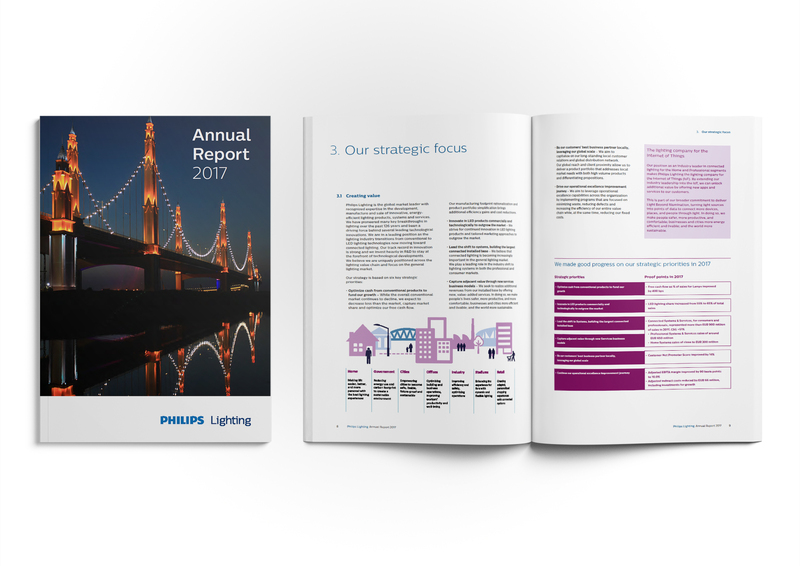 Their new annual report had to generally follow the design of the parent company, Royal Philips, but also had to embrace the individuality of Philips Lighting, without overspending. A core team of six people all had their responsibilities for certain parts of the report. Domani developed and implemented the design as an extension of that team. With the target group in mind, the choice was made for a simple and clear structure. Although the deadlines changed a few times, we dealt with it in a flexible and solution-oriented way.